I love this recipe for 90 second almond flour bread. 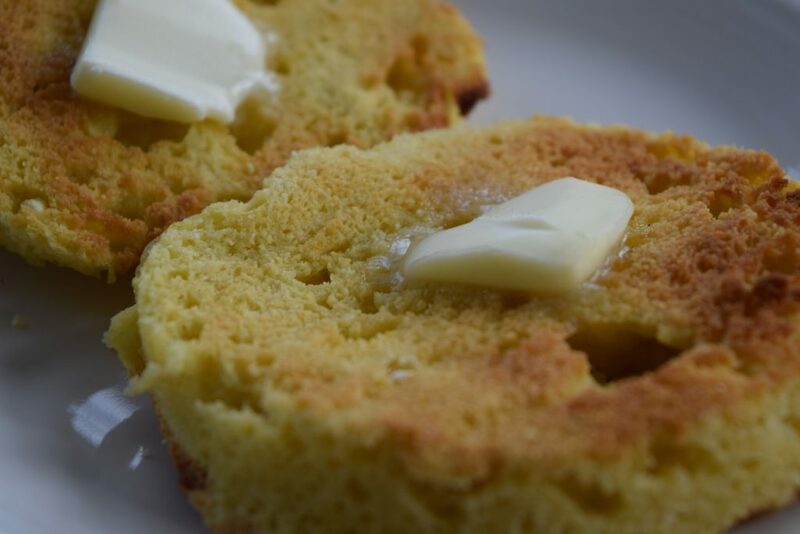 It comes out just like English muffins, completes with nooks and crannies for the butter. It also tastes amazing. 90 Second Keto bread is grain-free and gluten free. 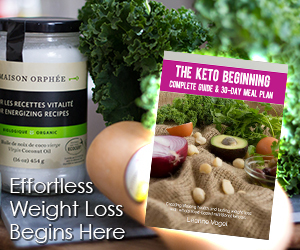 It is appropriate for paleo, keto, and no sugar no grain (NSNG) diets. Cook time is just 90 seconds in the microwave (hence the name, but I am adding oven baking instructions too). Almond flour does add a fair amount of calories though, so if you are trying to lose weight, don’t go crazy overboard with this! The English muffins are super easy to make. There are just four ingredients: Almond flour, baking powder, butter, and egg. You should mix and microwave this in a small bowl or large coffee mug to shape it into the right size. I use a small Pyrex bowl like this one (affiliate link). If baking in the oven, mix in a separate bowl and bake at 350 for 20 minutes in a buttered or oiled dish (Thank you Jam in the comments for this info!). Melt the butter, wisk in an egg, wisk in the baking powder and almond meal, and microwave for 90 seconds. It will slide right out of the bowl (you will want to use napkins or hot pads) and can be sliced and toasted. It will be spongy if you don’t toast it, but toasting makes it crisp. Yum! Here is a video of mine. Recipe card is after that. I call this one Angelic because it is clean and NSNG. These look moist and delicious! Thank you for sharing. I’m going to book mark and try. I do not know. A Flax egg will certainly help bind things, but I don’t think it will help the muffin rise. So it might come out denser. If you try it please report back on how it went! They look really great! I am always on the look out for keto snacks and recipes and this looks right up my street! This looks so yummy and perfect for any time of the day! Would love to give this recipe a try. this needs to make an appearance at brunch this weekend! thanks for the delicious idea! They look so delicious! Never used almond flour before but I’m excited to try it out! 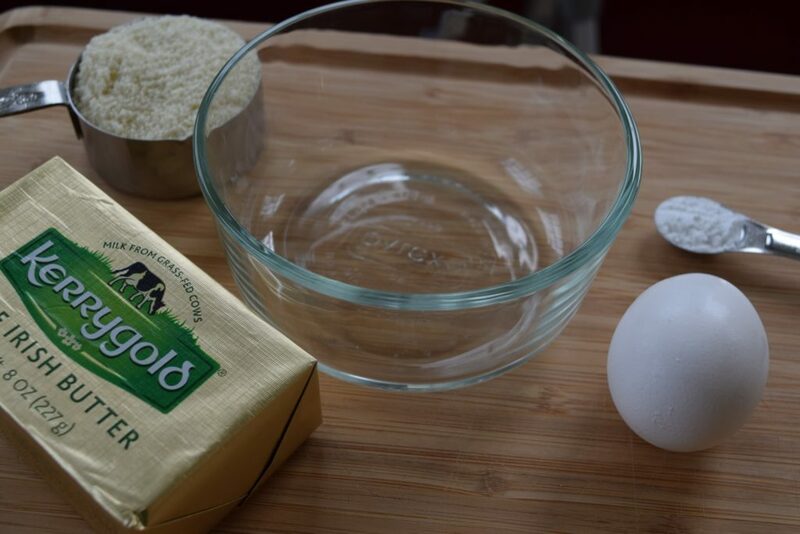 4 ingredients, 90 seconds, that sounds like the ultimate breakfast recipe! 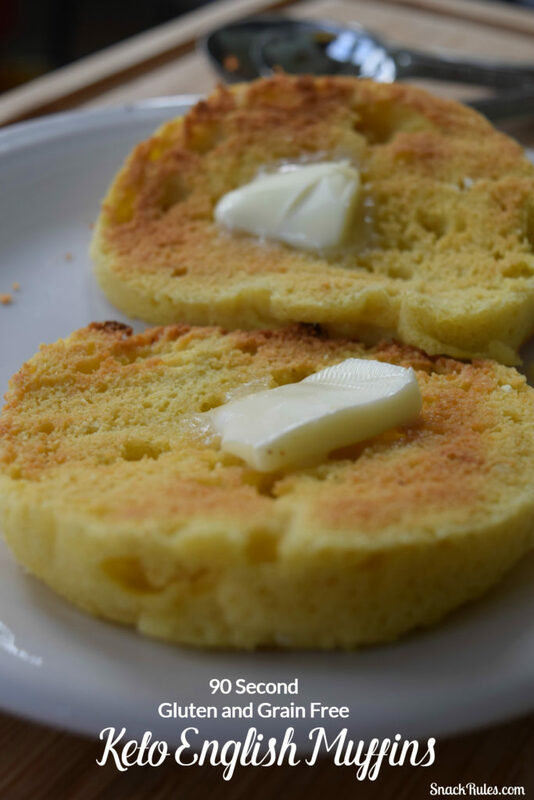 This Keto English muffins looks so yummy and tempting. Would love to give this a try. How do you store the bread after it’s made? In the fridge? I make these as I use them since it takes only about 5 minutes total to mix the ingredients, microwave, and toast. So I never store it. If you wanted to store it, keeping it in the fridge would be fine. Would it work with coconut flour? I haven’t tried it with coconut flour but I think it probably would. I have substituted coconut four for almond flour in other bread-type recipes with no problem. If you try it, let me know how it works! I’ve used another recipe with both coconut and almond flours. The coconut flour makes for a much drier muffin. The flavor was still good, just very dry. No. I use this recipe all the time, splurge on the almond flour….totally worth it. Awesome! Excited to try with herb butters and other tweaks! Just missing macro deets??? These are super yummy currently having one with bacon and egg… how many carbs per scone? Carb count on them is quite low. Roughly 7g carbs with half of that being fiber, so maybe around 3-4g net carbs. Can it be made in the oven? We do not own a microwave. If so, what type of mold do you think I should use? I have no idea if it could be done in the oven! But, I don’t see why it couldn’t be. Maybe try it at about 350-400 degrees and see if it works? You could use the same type of glass bowl that I use for the mold. Found this recipe on Pinterest. I like the ingredients you use in this recipe, it’s definitely doable! My health coach has a firm no-microwave rule that I follow so I’ll fiddle around with the recipe and see how it turns out in the oven. Thanks for the recipe! If it works for you in the oven, let me know! This is a fantastic recipe! I followed your suggestion for oven baking, 350° for 20 minutes—perfect! I love that you can make them as you need them, and they are so easy…thanks so much for this recipe. PS, you will want to butter the dish before baking. Next time, in like 5 minutes 😬, I will mix in a separate bowl and bake off in a buttered dish. Thanks for the baking info! I am going to add that to the recipe for those who don’t want to microwave. Really good recipe. I ran out of almond flour mid making them today and made up the difference for 1 muffin with 4tsp milled flaxseed. I like the idea of using flax! A bit less calories and it adds Omega 3! OMG! Just made this and it was amazing! Thank YOU! Couple notes: I made in a round 7 oz ramekin and added some Trader Joe’s Everything But the Bagel Seasoning. Cooked in microwave for 90 sec exactly and what I ended up was 3 slices! I had a “muffin top” that I sliced off, toasted and put cream cheese on. Then the second part I sliced in half and toasted and made a breakfast sandwich out of. So super easy and got so much for it! I like the idea of trying cashew flour! I tried this keto English muffin this morning, is there any way to put some moisture into this muffin, it is dry! Very little that I have tried labeled “Keto” have I thought it worth eating again. I tried the keto almond flour pizza crust. I swear it tasted like cardboard…yuck! I can stomach the cauliflower pizza crust, but finding it hard to live on keto pizza. 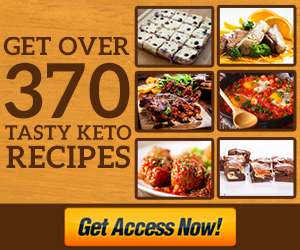 Has anyone fixed anything keto that was as good as regular food…I mean people post keto receipes and call them delicious? It makes me wonder what they were eating in their previous life. Normally before toasting, these are rather moist. I suggest simply toasting them less if you find them dry. Anyway, I love these things. I actually prefer them over standard bread. I’m not a big fan of the almond meal pizza crust though. I just made these! I modified the recipe by using ghee butter, 1/4 tsp vanilla extract (organic) dash of Himalayan salt, 1packet of stevia and I poured it in pregreased tiny muffin tins! They were really good! I will try again with vanilla ghee a litttle more salt! Thanks for the recipe! These are awesome, very moist. I couldn’t believe how they kept their shape and were easy to cut in half. Tried toaster to crisp and were even better. Very easy and delicious. I could have every day, in fact I might. Thanks! This was delicious as is! It was tasty with my eggs, thinking eggs Benedict and breakfast sandwich! Yum!!! love them! dead easy to make and love my egg on “toast” again to soak up the runny egg. I will branch out with some of the ideas above. Thanks from an Aussie! Made this English muffin this morning. used a coffee mug, made as directed. I would use a larger bottom dish or mug, yes it would be thinner. The half muffin did not allow for a safe removal from toaster, so instead, it was Grilled it in my cast iron Skillet. A good taste. I would consider adding a touch of spices to the mixture before cooking. Loved it. It’s a really good consistency. Doesn’t take like egg. I have also added some garlic and made it into a mini pizza! I fired instead of toasting but I’m sure that it’d be the same. Then I popped it back in the microwave for 30 with some toppings on it! Tasted great. I updated to include nutrition info. Net carbs is around 4.5. After 8 weeks with no bread of any kind we find these to be amazing! Love it toasted with a sliced of cheese on top! YUM! Well, this is heaven. I’ve been grain free for over a year now, so this is huge for me! I just made it in a soup bowl and sliced it so it will go in the toaster. Second batch I added a little cinnamon and stevia. This works!! Thank you. Made this for breakfast. Smelled a little eggy when first out of the microwave. Toasted it and tastes great. Made two muffins with this recipe. 90 was too long but I did make two which would affect the time. Will make these again and again.